Home / Latest / Sushmita Sen / Sushmita Sen performing Dhunuchi dance at Durga Puja celebration with daughters! Sushmita Sen performing Dhunuchi dance at Durga Puja celebration with daughters! Sushmita Sen is one of the finest looking actress of Bollywood. The actress never fails to impress anyone. She is a proud mother of two daughters and she often posted her pictures with them. Recently, she visited a Durga Puja pandal along with her two daughters Renee & Alisah during the ongoing Navratri season. 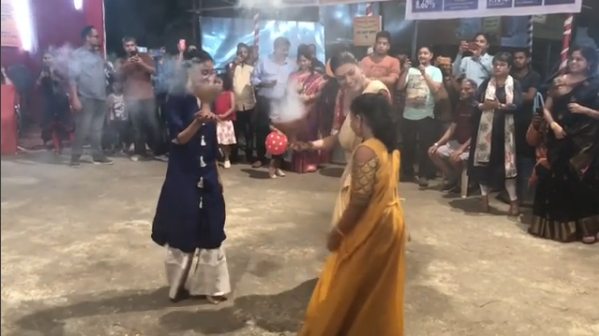 Meanwhile, a video of the actress doing a Dhunuchi nach (dance) with her elder daughter Renee at Durga Puja celebration is going viral. Sushmita was looking stunningly gorgeous in a beige-coloured sari teamed with a red embroidered silk blouse. She tied her hair up in a neat bun and rounded it out with a red bindi. While, Renee is wearing royal blue long kurta with a white palazzo. The duo are seen holding an earthen vessel with incandescent smoke emanating from it and dancing and swaying to the rhythm of the song and the Dhak beats. My #duggadugga #lakshmi #saraswati #ganpati & #kartikeya ❤️😇🙏💃🏻#subhoashtami to you & all your loved ones!! !😇😁❤️💃🏻 pronams to #maakali 🙏love you guys!!!! She also share a pictures of her daughters with caption: My #duggadugga #lakshmi #saraswati #ganpati & #kartikeya ❤️😇🙏💃🏻#subhoashtami to you & all your loved ones!! !😇😁❤️💃🏻 pronams to #maakali 🙏love you guys!!!! Meanwhile, the actress was currently in the news for her relationship with Rohman Shawl. She had reportedly met him at a fashion gala, a few months ago. Those close to Sushmita say that she and Rohman are very close and there is a whiff of romance in the air.